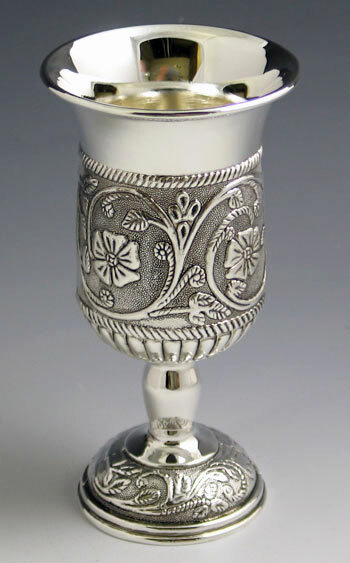 Silver Plated Kiddush Cup with Stem. This Cup has a unique ornate design. An affordable wine cup for Shabbat, Holidays and Jewish Weddings. You will have the option to personalize as you proceed to checkout. Silver plated Kiddush cup on a stem with a lovely floral design. An ornate Flowery theme that has fancied shoppers for the span of many years. This Kiddush cup has been a best seller for quite some time. Wine cups are used in almost every Jewish ritual as on Shabbat, Yom Tov (Holidays), Jewish weddings, Bar and Bat Mitzvahs and Chupah's, this cup will adore and enhance your celebration. A cup with solid weight for a safe and strudy display, the wine will not spill that easy!